When cordless power tools started getting good, back around 2006, manufacturers always said a cordless random-orbital sander was out of the question. Too much continuous power draw, they said. The batteries couldn't handle it. The closest you could come to a 5-inch tool—the type pro woodworkers and jobsite carpenters use every day—were these puny little detail sanders that'd be dead before you could scuff up a door stile. Well, Makita finally figured it out. The secret, according to Makita's Wayne Hart: "This was not a retro-fit job on an existing corded or cordless tool to accommodate an 18V battery." Instead, the engineers built the motor and other components around the existing 18V Lithium-Ion battery, optimizing power and runtime for a cordless platform the company has used for years. The finished product is a 3.6-pound tool that will run 20 minutes on the high speed setting (or 40 minutes on the low setting, which nobody uses much). So, sure, it's not perfect. But that's plenty of power if all you're doing is climbing a ladder to smooth the putty on a patched soffit to prepare it for a coat of paint. 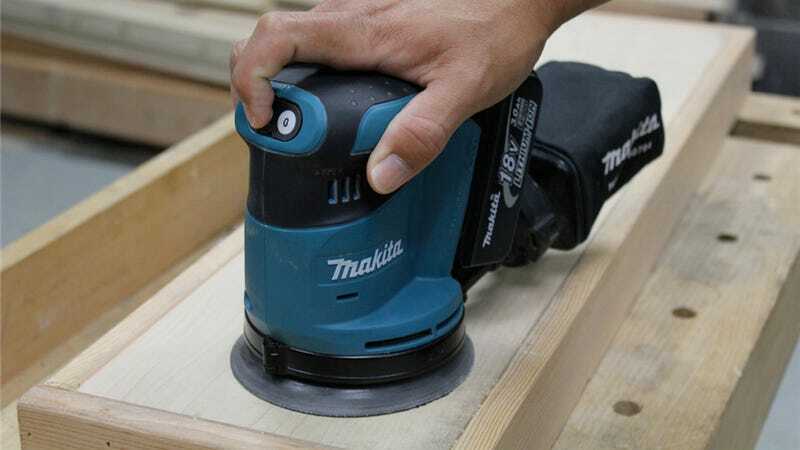 The ideal customer for this sander already owns tools in Makita's 18-volt lineup—the $143 price for the bare tool (at ToolsUp, not in stock yet) is a far better deal than the kit with two batteries and a charger, for $286 at Amazon. 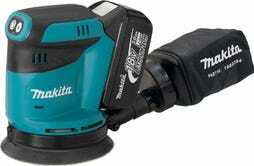 Even so, this is a lot pricier than Makita's AC-powered sander, the BO5031. If you're not ready for this wave-of-the-future cordless business, that $85 product is a fine alternate—a 4-star model as reviewed under the rigorous scrutiny of Popular Mechanics' Roy Berendsohn.